This is a guest post by Brian Hopkins, an occasional contributor to our blog. If you like his activities, check back frequently to see if he's got a new post up! You could also check out his blog, Hopkins' Hoppin' Happenings, which has a Common Core focus and posts with topics as diverse as phonics, science, and math. It’s Brian again from Hopkins' Hoppin' Happenings. I am so excited to get to guest blog again! Last time, I gave many different ideas on teaching the alphabet. Today, I will be sharing with you some fun ways to teach sight words. I also have some happy news to share: I just landed a new job teaching kindergarten! Sight words are tricky for many students, because with most sight words, you can’t sound out the words—you simply have to know the letters. These are words that students should be able to read and spell fluently. 1. Spell the words using magnetic letters, Cheez-It letters, beads, letter tiles, letter Unifix® cubes, etc. Then have the child transfer the word to paper. 2. Play board games, dice games, or card games that involve reading the sight words you are working on. 3. Write down the word and the page number each time you find it in a book. 4. Use highlighter tape to highlight the word in the book. 5. Find the sight word in a book using a magnifying glass. 6. Write a sentence using the word. 7. Spell the word with rainbow colors. 8. Use different chants and hand movements to learn the word. For example have the children say the letters in the word and clap the consonants and snap the vowels. 9. Take the children outside and give them sidewalk chalk to practice writing their spelling words or use shaving cream to write them on their desks. 10. Spellingcity.com is a great website where you can type in the sight words and it has many different activities to help the students learn how to spell them. I hope these ideas help your students learn their sight words in a fun way! My name is Brian Hopkins and I am from Brevard County, Florida. I graduated from the University of Central Florida with a Bachelor's Degree in Elementary Education K–6. I also have my ESOL endorsement and am CET certified to mentor teachers and have student interns. I taught kindergarten for three years, 2nd grade for five years, and completed a short term in 5th grade. I also subbed in a 3rd/4th grade class for a month. Currently, I am a kindergarten teacher! In my spare time, I enjoy listening to country music, reading, and making teaching materials. 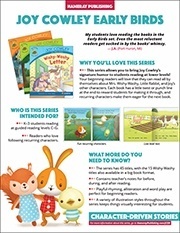 To learn more about the Joy Cowley Early Birds series, which contains the Wishy-Washy Clothes book shown in this post, visit the website by clicking here or click the image below to download an information sheet with series highlights!